After Remodel - For this bathroom, concrete was used to replicate a 1920’s apothecary look. 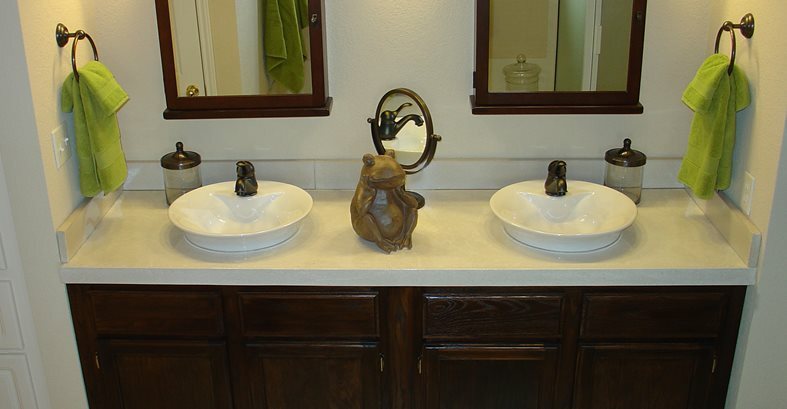 Before Remodel - The existing double sinks lacked personality. Using concrete to create different designs, colors, and shapes is often what makes it such a unique material to work with. Just about any look imaginable can be created with concrete. Recently Greg Bright, owner of Ancient Art Concrete Countertops in Austin, TX, was faced with that challenge. 'Create a concrete countertop with an 'apothecary' look' was the request made from a client remodeling their bathroom. "I had never heard that word," recalls Bright. "I had to Google it and look it up!" Apothecary is an historical term used to describe a pharmacist or druggist. "It's reminiscent of the 1920's or 30's," says Bright. "The homeowners wanted the countertop and sinks to look like that era. Usually the countertops would have white porcelain tops, with white containers." After researching, Bright thought that Buddy Rhodes' bone white mix would work best to achieve the look. "We don't do many countertops in plain white, so I thought this project was unique. I suggested to the clients that we use the bone white color with a hard troweled finish." "We designed and installed everything, including the medicine cabinets, lighting and towel fixtures. We also stained and modified two 36-inch red oak kitchen cabinets off-the-shelf from Home Depot, making them reminiscent of the era," explains Bright. "A new trend in design I've noticed is putting countertops on pieces of furniture," he says. "So, we created tapered furniture legs to use instead of spacers to bridge the cabinets. It looks more like a piece of furniture this way." "The client also specified needing more storage space," says Bright. "So we used kitchen cabinets at 24" depth, and the taller height is actually proving to be more ergonomic for an average height person." "To squeeze even more storage space out of the area, we used American Standard porcelain vessel sinks that were half above and half below the countertop," explains Bright. "This left just enough room to run the drain pipe and supply lines right between the two drawers on each cabinet. Therefore, all 4 drawers are fully functional." The countertops were done cast in place, 2 inches thick. "We did a hard trowel finish, and slightly honed the top. The clients wanted the top to look like stone, so we wanted to expose as little aggregate as possible," recalls Bright. The countertop size was 80" by 24," with an eased edge. "It's a squared-off edge, and we ease the sharpness with an 800 diamond hand pad. We've found that works best on this mix," says Bright. In the end, Bright's clients were ecstatic. He had risen to the challenge and succeeded at using the versatility of concrete to capture the 'apothecary' look and design they had imagined.